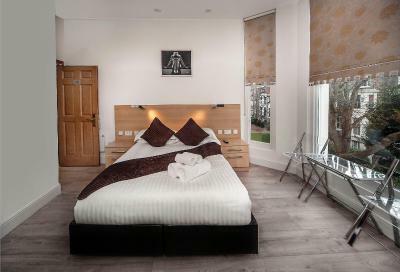 Lock in a great price for 88 Studios – rated 8.5 by recent guests! Location was nice and relatively quiet, but still easily accessible by public transport. Cleaning service was excellent, they came by every day and besides tidying replaced the cookies and mineral water every time (always a plus). Room was fine and had a splendid bathroom. 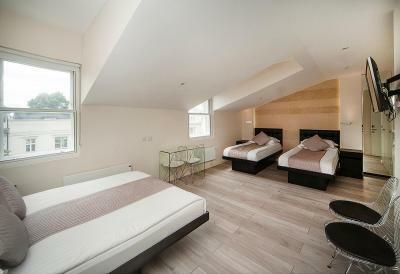 Definitely something I would recommend to friends for a short stay in London! 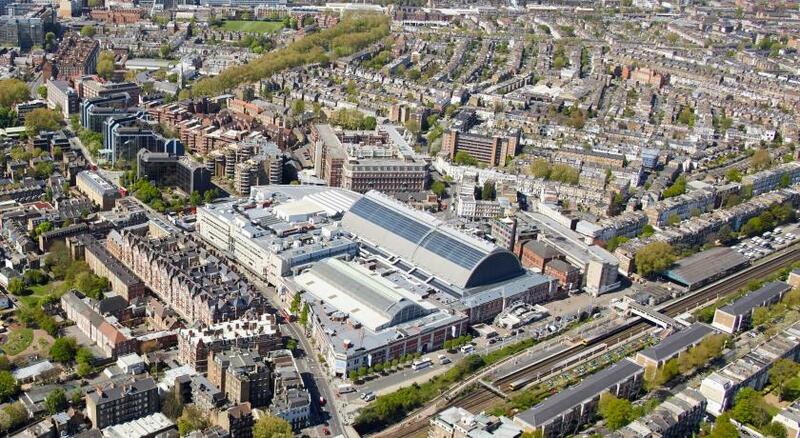 The nearest tube station, Shepherd's Bush, has a Westfield mall, loads of eating places and coffee shops. The hotel is wonderful, can't fault it at all. Very clean and the kitchenette is a great addition. Loved the complimentary tea, coffee, cookies and water. Great place to stay. We absolutely loved staying here! The staff was very kind and helpful, always respectful and with a friendly smile on their faces. The apartment really had us surprised - it was simply gorgeous. Small but still big enough for three, even four of us. 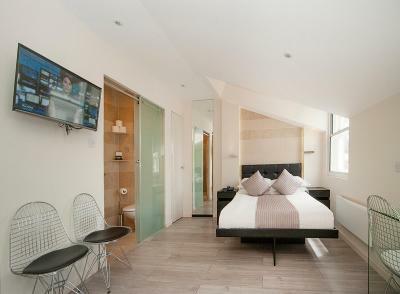 Beautiful modern design, we loved the LED lights next to the beds and in the bathroom. They have a lot of stuff, from ironing table to a microwave and coffee capsules. The beds are super comfortable and the showers very lovely. The sink is a little small but honestly, that's fine. 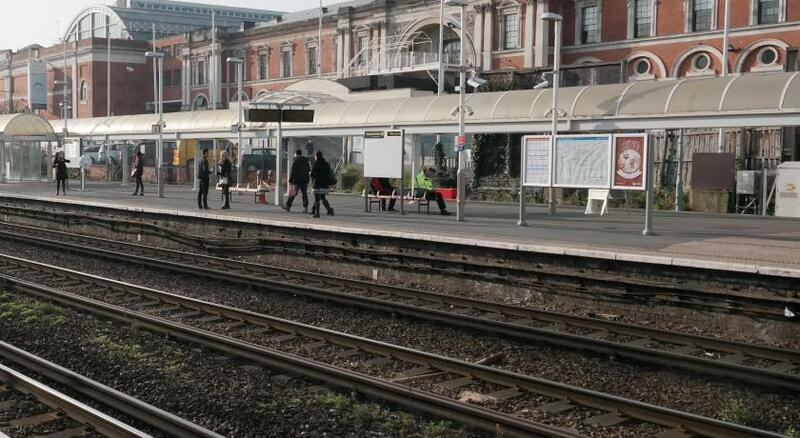 The location is great with many busstations nearby to different locations and the Overground maybe five minutes away. Loved everything about it and will definitely come back next time we are in London! Everything in general was fine. Nice staff, good location and reasonable price. 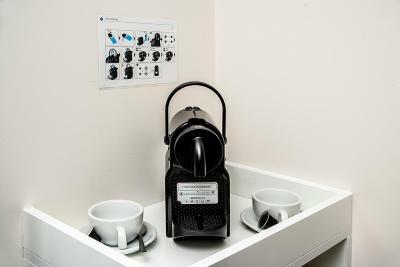 The room was comfortable, clean and well equipped with all kinds of kitchenware, coffee refills, biscuits and water, all free. I got a room on the lower ground. The first impression was a bit claustrophobic but then later I got used and after 3 days I ended liking it. I will for sure check availability of this hotel next time that I come to London. The room was very small but the space management was great. You could find anything you needed if you looked for it :)) coffee, tea, water and some biscuits were provided free of charge, which I found very nice. The staff was very friendly and helpful. I needed to make a phone call after checking out and the woman at the reception was very patient and helpful :) And the location, although 15 minutes walk from the nearest underground station, felt safe even at 2am for a woman (at 2am the underground is almost the way of transportation). Super friendly staff, always happy to help you with any requests. 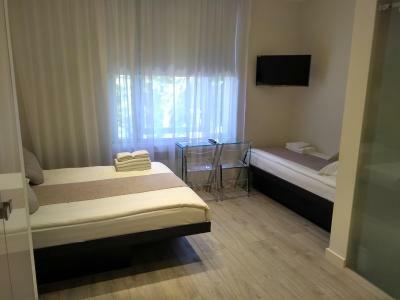 The property and rooms are modern and very clean. 88 Studios This rating is a reflection of how the property compares to the industry standard when it comes to price, facilities and services available. It's based on a self-evaluation by the property. Use this rating to help choose your stay! One of our top picks in London.Located just 1,300 feet from Olympia Exhibition Center, 88 Studios offers accommodations in the London borough of Kensington. Free WiFi is featured throughout the property. 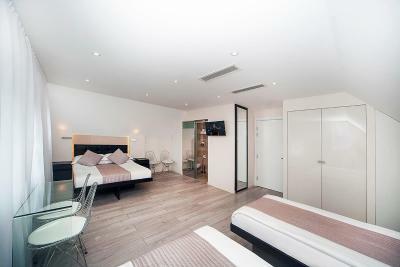 The rooms offer an equipped kitchenette, air conditioning and flat-screen smart TV. 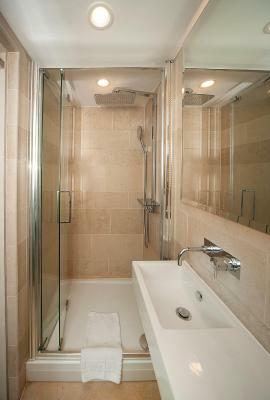 The private bathroom features a rain shower and complimentary toiletries. 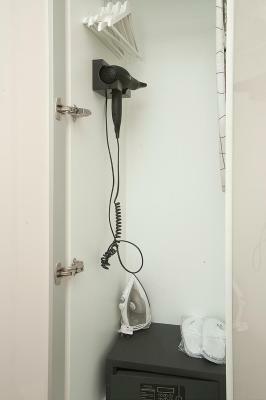 There is a 24-hour front desk and daily maid service at the property. 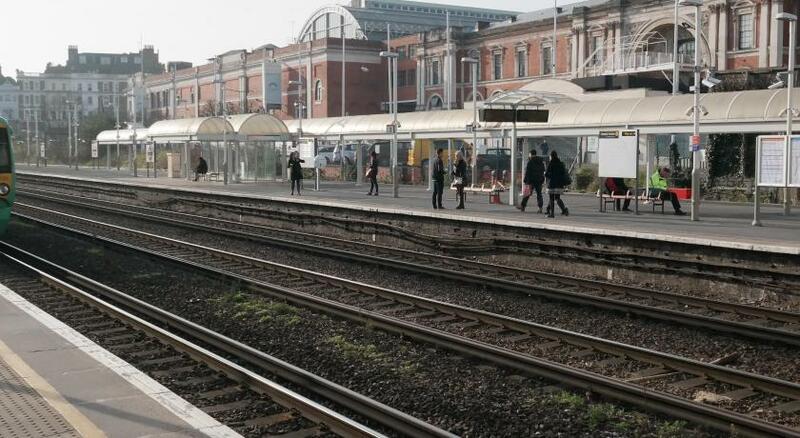 Kensington tube station is just 0.8 miles away. Westfield Shopping Center, The Kensington Gardens and The Kensington Palace can all be reached within 1 miles from 88 Studios. The Royal Albert Hall is 1.4 miles away and Hyde Park is 1.6 miles away. 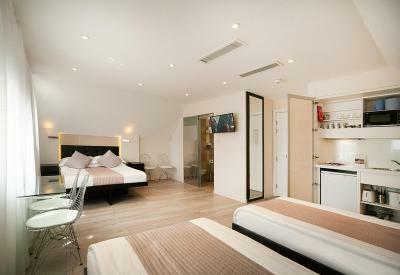 When would you like to stay at 88 Studios? 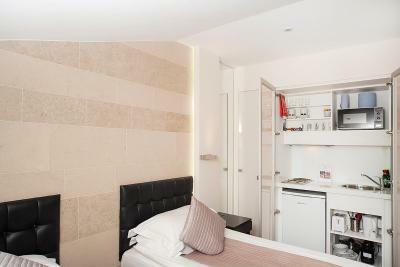 This apartment features a fully equipped kitchenette, en-suite with a shower, and 1 single bed. Please note that for bookings of 3 or more rooms, the first night is taken as a nonrefundable deposit for each room booked. 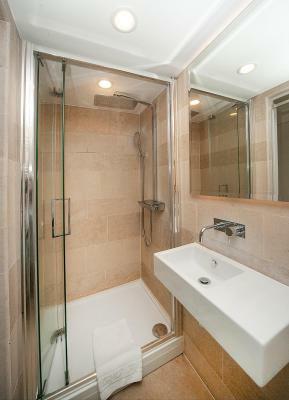 This apartment has a fully equipped kitchenette, en-suite with shower, and 1 double bed. 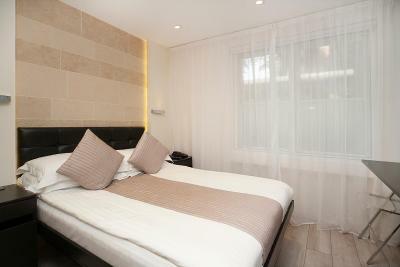 This apartment features a fully equipped kitchenette, en-suite with shower, and 2 single beds. 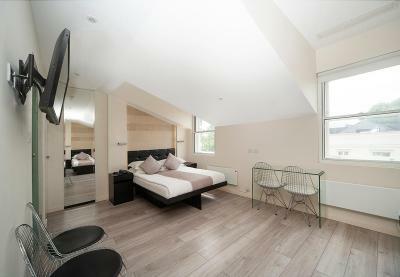 This apartment has a fully equipped kitchenette, en-suite with shower, 1 double bed and 1 single bed. 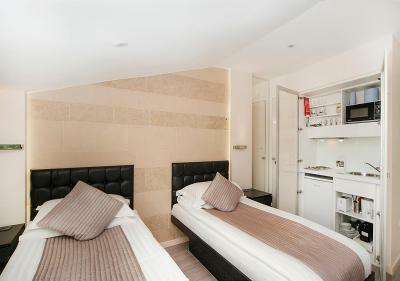 This apartment features a fully equipped kitchenette, en-suite with shower, 1 double bed and 2 single beds. 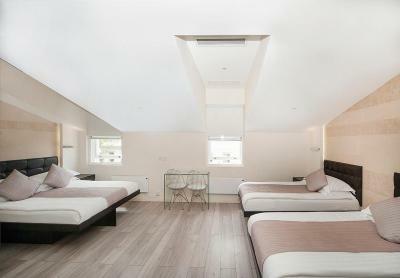 Newly refurbished and opening in April 2016, 88 Studios provides an ultramodern, chic, comfortable and boutique accommodation in London. 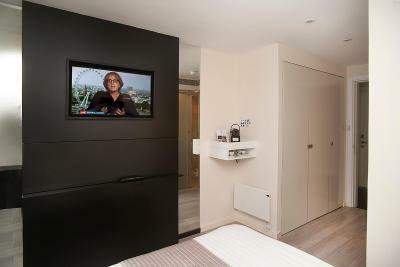 Located in Kensington, one of London’s most up-market areas, 88 studios is the ideal choice for those who want to explore all of London, offering quick and easy access to the city centre. Just minutes from the hotel is Kensington High Street, Holland Park, Westfield Shopping Centre, Kensington Palace & Gardens, Hyde Park, and The Royal Albert Hall. 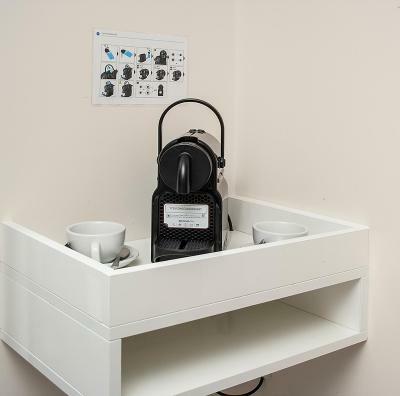 88 Studios is an ideal choice for those wanting to feel at home by taking advantage of the fully equipped kitchenette. 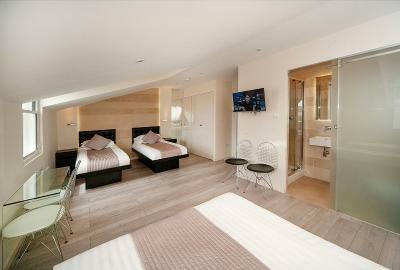 Those travelling with family enjoy the flexibility of the triple and/or quadruple rooms on offer. House Rules 88 Studios takes special requests – add in the next step! Debit card 88 Studios accepts these cards and reserves the right to temporarily hold an amount prior to arrival. 88 Studios accepts these cards and reserves the right to temporarily hold an amount prior to arrival. Photo identification is required at the time of check-in and must match the payment card used at the time of booking. The payment card used at the time of booking is required at check in. 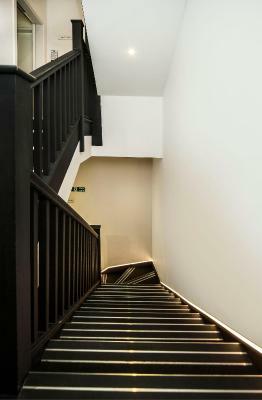 A security deposit of GBP 50 will be pre-authorized on the guest's card upon arrival for incidentals. This deposit is fully refundable upon check-out and subject to a damage inspection of the accommodations. The room was tiny - I kept my case on the bed. They didn't replenish milk, coffee or toilet paper after the second day. 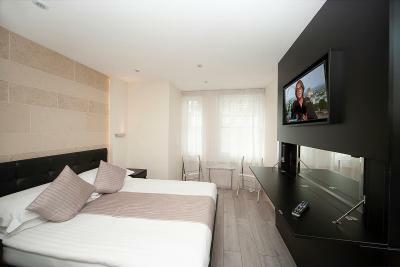 The apartment for 3 adults was very-very small and it is annoying that pictures are showing very spacious rooms. If we knew the size of the room, we would have chosen something else for sure. everything about the stay was first class including the staff. My only small negative was that the room was actually a little too hot. But this was easily remedied by opening the window and turning the heating off. Also it wouldn't have been an issue if the weather hadnt have been so nics. Staff where really friendly, facilities in the room where excellent perfect stay for the night for two adults and a toddler. Also the information provided at the hotel made it really easy for us to go out for dinner and also pick up a few bits. The bed was a small double which was ok for me at 5ft 4ins but not for my 6ft 2ins husband whose feet hung out of the bed! The bed was comfortable though. You couldn't sleep with the window open in one of the front bedrooms as there was a noisy main road but very little noise when the windows are shut. 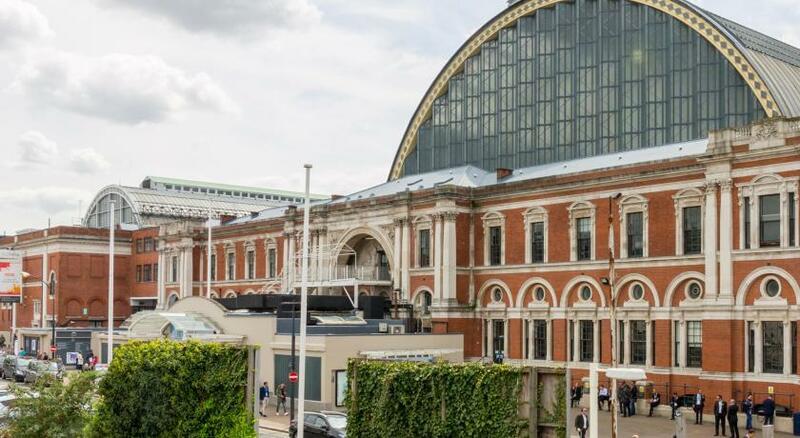 The hotel was 10 minutes walk away from Shepherds Bush station where there's a shopping centre, the Olympia exhibition hall was only 2 mins across the road. The room had all facilities, tea and coffee, bottled water every day, a microwave, etc. 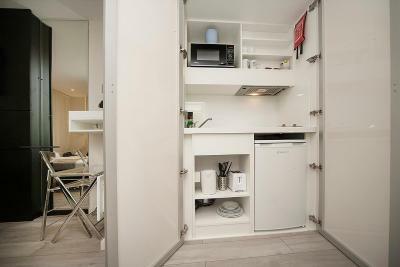 Although very compact and a good use of space. Did not like the customer service. Car was broken into outside the hotel and when we went to ask for a hoover or bin bag they refused and manager was very abrupt. Didn’t care that my wife was distressed as our windscreen was broken. 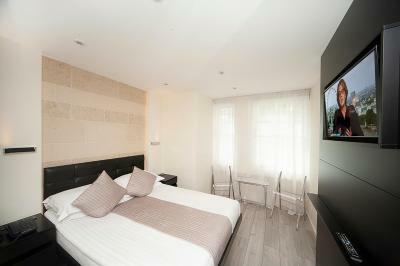 Great location for Olympia (ten mins walk) and Kensington. 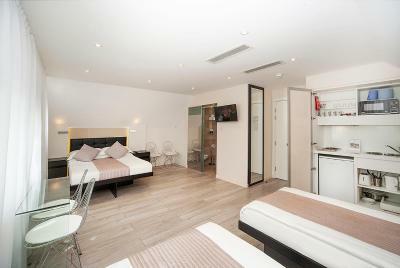 Easy to walk to Shepherds Bush to eateries, Westfield etc. Good check out time, allowed time to go out for brekkie and back again and then leave luggage to pick up later. Really clean and nice quiet room. 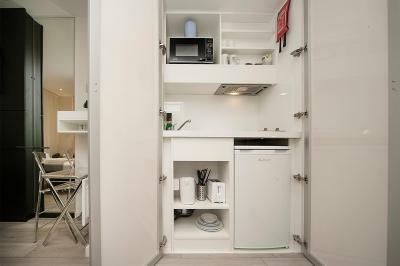 We went for apartment which had kitchen in a cupboard, could easily bring in food to make if you don't want to go out. Big fridge ! Hello I didnt get any sleep due to noise from other rooms. Cleanliness was not up to expectations, had to request for floor to be cleaned twice. Kettle had been used by previous guest, still had water and tea leafs inside. Asked to clean it, they brought a new one but didn't remove the previous (still not cleaned the day we left). Hairdryer in the bathroom didn't work, they brought a new one. No phone in the room to contact Reception so every time we needed something we had to cross the (very busy) street. Do not disturb sign is double faced and on two occasions we got knocks on the door with the sign on, not sure if our mistake, another guest's prank or the maid's mistake but it can be confusing. Location is great, area is quiet overall but on busy street. Ask for a room with views to the back to avoid noise. Good access to main roads. Rooms have all essential items to spend a few days but ours was smaller than publicized. Bathroom is updated and big mirror is a plus.